The present compilation contains 51 Amazigh texts of various genres (narratives, fables, legends, chants) which were collected within the framework of a research project dealing with the lexic of the oral literature of the Figuig region (a place of oasis with approx. 13,000 inhabitants in the utmost southeast of Morocco). For this volume the author predominantly included texts which he heard himself during his childhood. At first, Benamara collected the versions of a variety of narrators to be able to reconstuct and document some kind of “original version” of the narrations from the transcriptions despite the discrepancies within the presentation or personalisations of the narrators. This “original version” was then put into proper written form and translated into French. 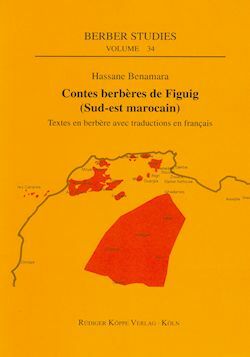 The present book contains these texts – with the Berber transcriptions on the left and the French translation on the right page –, a detailed introduction with information regarding the oral literature of the Figuig region and the transcriptions as well as an epilogue with references to the particular narratives and information concerning the 20 (female and male) informants. With this collection, the author intends to contribute to the preservation of the, compared to other Berber regions, insufficiently documented narratives of the Figuig region before they are – for example due to the cultural influence of school education and television on youth – forgotten. By the same author a collection of Figuig poetry has been published, see under additional material.